If you want to stay in superb accommodation at an affordable price then look no further than our privately owned Orlando vacation villa . 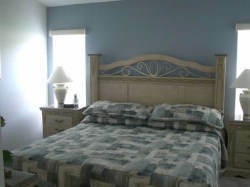 Situated on an oversize plot within a beautiful conservation development, our vacation villa provides a base that offers peace and relaxation and yet is just a short drive from Walt Disney World, Universal Studios, dozens of championship golf courses and many other fantastic area attractions. And don't forget as well as the theme parks there are fantastic places for shopping and eating out nearby too! 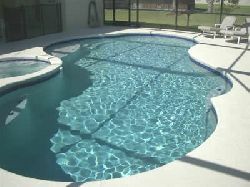 At well over 1,200 sq ft this is one of the largest screened pool and deck spaces in the area, with a 31' x 17' individually designed pool and spa which can both be heated upon request. Ample pool furniture including loungers, recliners, ottomans, tables and chairs. 5 bedroom / 4 bathroom accommodation decorated in true Floridian style, including two master suites with bathrooms and private access to the pool area, a further en suite bedroom and an additional two bedrooms and house bathroom. Games room with high quality 8ft slate bed pool table, 8ft air hockey table and electronic dart board. Fitted kitchen with range, built-in microwave, dishwasher and a 19 cu.ft refrigerator with ice-maker. Games console with selection of games. DVD player and a selection of movies. TV's with cable in all bedrooms. High speed Internet access with WI-FI. Free International telephone calls to 21 countries. Separate laundry room with washer and dryer. 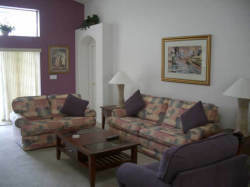 Our Orlando vacation villa is professionally maintained by a local company who is located less than two miles from our home and they are at your service 24 hours a day. 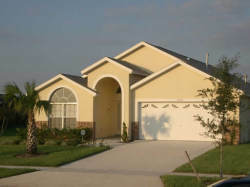 Unlike many Florida villas we do not rent our home with the sole aim of making a profit, this is our vacation home too and we want you to find it as we would wish to find it.